My first post of the year related to books is an author interview. 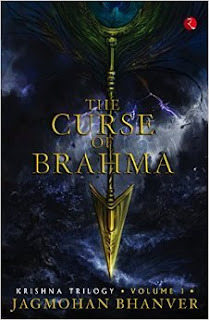 I have read and reviewed 'The Curse of Brahma' in my blog earlier and here is the link. I have thoroughly enjoyed reading this book. 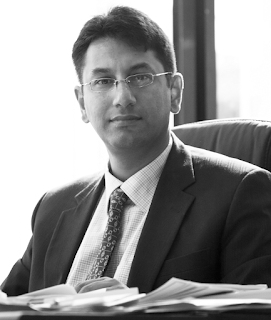 His latest paper on “leaders as super motivators” has been finding takers in various corporate houses globally and has also been introduced in top B-schools as part of management lessons for executive MBA’s. Jagmohan is the winner of the Indian Achiever’s Award for Excellence in Education in 2009. He was awarded the Rajiv Gandhi Shiromani Award for outstanding individual achievements and distinguished services to the nation. Subsequently, he was also the recipient of the Rajiv Gandhi Excellence Award. He is also the recipient of the Shiksha Bharati Award. 1. Why did you choose the genre - Mythological fiction for your book? Do you love mythology? Is there someone who inspired you to write a book on Krishna Trilogy? I firmly believe that mythology tells us a lot about our culture and our past. In most cases what is termed as mythology in India in any case is not myth. It is part of our history; our heritage. Just because we might have forgotten part of it and allowed dust to settle on it, it does not turn facts into myth. Therefore when I saw that for several years now, Indian history and heritage was being written off as mythology, I was a bit taken aback. I knew we in India have the benefit of mythology (or history) that is perhaps more exciting and invigorating that anything else, anywhere in the world. Unfortunately, children today do not spend too much time reading about Indian mythology or history. They are keener to read about Greek or Roman Gods and Goddesses. While there is no harm in reading books based on other cultures, there is equally nothing that should keep us back from reading about own heritage. The interest in other culture’s mythos as against our own is primarily due to the fact that Indian mythology is mostly narrated in a very conventional manner and even the language and style of writing is not very aligned to what young audiences today want to read. Therefore when I decided to write a book around Indian mythology, I wanted to change this with my own little contribution to this domain. The Curse of Brahma (Vol 1 in the Krishna Trilogy) has hence been written in a way whereby people are able to identify with aspects of our culture and young audiences are also motivated to read it because the language is contemporary. 2. You might have done a lot of research to write on Krishna Trilogy. What books did you refer? How much time this research took you? I took a sabbatical from my banking career in 2004, and started reading whatever material I could find on Krishna, including Vedic texts that date back thousands of years. 3. What are your favourite authors in the current generation? I think Rohinton Mistry is an amazing writer. Most of his work falls in the “slice of life” kind of style. Favorite books would include Family Matters from Rohinton Mistry; Great Expectations from Charles Dickens; The mayor of Casterbridge by Thomas Hardy; Crime and Punishment by Fyodor Dostoevsky. Also, Hemingway, Charlotte and Emily Bronte, George Eliot, Tolstoy, Prem Chand. The list is endless. 4. Any message you would like to give for budding writers? writing is personal. One shouldn’t give or take advice on it. If however, you would want me to share a few things I have picked up on the way, I could do that. The decision to follow it lies with the other person. If you are writing nonfiction, select a subject where you are the expert. If it is fiction that you want to focus on, write about what you are passionate about. Don’t emulate the writing style of other authors Develop your own brand of writing and your own expression. There’s a greater chance of being recognized that way. And finally, don’t wait for the perfect moment to start writing. The perfect moment seldom happens. Make time to write. Use the weekend or the flight time or any other time you can make use of. But start writing!